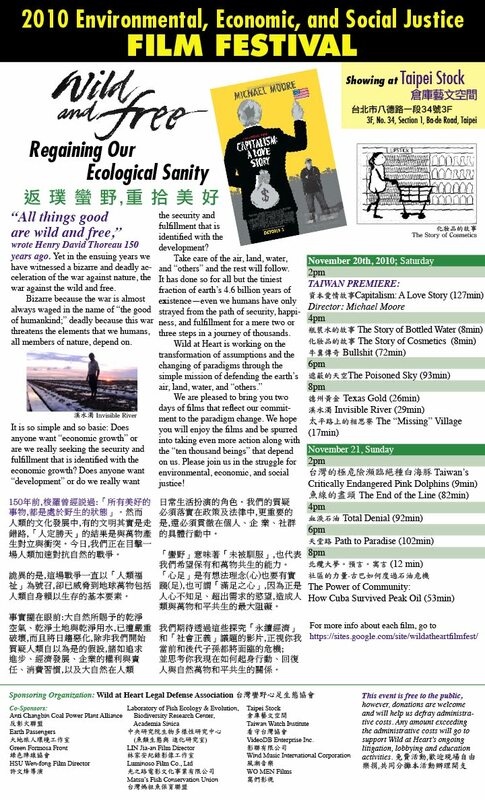 The 2010 Environmental, Economic, & Social Justice Film Festival will be held on Saturday, November 20 and Sunday, November 21 at Taipei Stock Theater. The Festival will kick off at 14:00 on Saturday, November 20 with the Taiwan Premiere of Michael Moore's Capitalism: A Love Story. Date: Saturday, November 20 & Sunday, November 21. Where: Taipei Stock Theater, 3F, No. 34, Section 1, Ba-de Road, Taipei. This event is free to the public, however, donations are welcome and will defray administrative costs. Any amount exceeding the administrative costs will go to support Wild at Heart's ongoing litigation, lobbying and education activities.